Through an agreement with Control Vision Corporation (CVC), Jeppesen announced today the rollout of integrated 100LL.com fuel pricing functionality for Jeppesen Mobile. • Advanced fuel search capability including fuel type, type of service, and proximity to any airport, VOR, or fix. “With the current high fuel price situation in the U.S., Jeppesen Mobile customers can now have instant access to the most up-to-date domestic fuel pricing information available on the web, potentially saving hundreds of dollars on a cross country flight,” said Dan McGaw, Jeppesen business programs manager, Business & General Aviation. Updated on a daily basis by CVC's 100LL.com subsidiary, pricing information for 100LL and Jet A are conveniently sorted by distance and direction to the airport using the advanced fuel search feature now integrated into Jeppesen Mobile's AF/D (Airport Facilities Directory). Powered by Hilton Software—a Jeppesen alliance partner—Jeppesen Mobile consolidates critical pre-flight, in-flight and post-flight information and functionality into a single, integrated package. 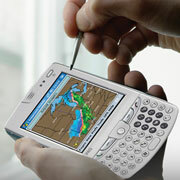 Jeppesen is currently working to develop a Blackberry version of Jeppesen Mobile for release in early 2009. The new Jeppesen Mobile fuel search feature is included in the $169 price which also includes a full year of update services covering the continental United States. Subscription renewals after the first 12-months of service are just $129 per year. Pilots are encouraged to download a trial version of Jeppesen Mobile by visiting www.jeppesen.com/mobile. The trial version can be downloaded directly to a phone or to a PC and then uploaded to a phone or PDA. For additional information call (800) 621-5377.